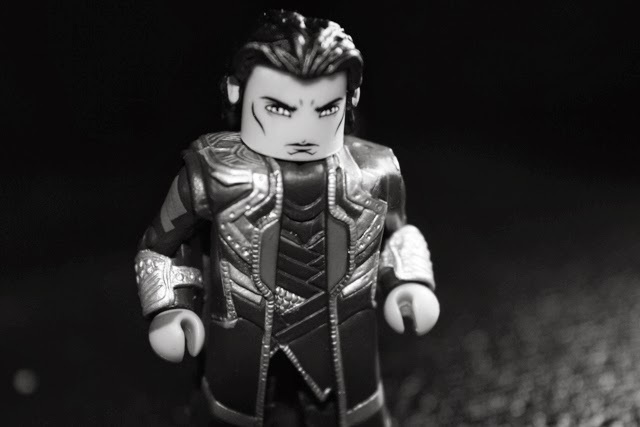 Thor 2: The Dark World will be available on Bluray and DVD on February 25th, which is a great reason to take a look at this set of minimates. I'm a little late to the game and didn't pick up any of the Thor 2 figures until a couple weeks ago. I saw them at my local comic book store and decided I needed them. 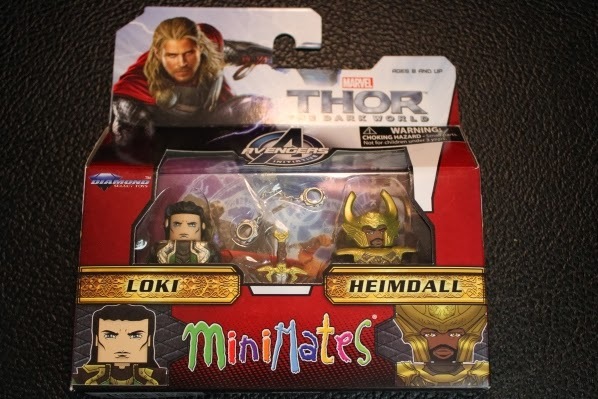 Loki and Heimdall? In the same box? The two you want are never packaged together! We're usually forced to buy half a dozen Hydra soldiers...or a new and (slightly) different Wolverine. 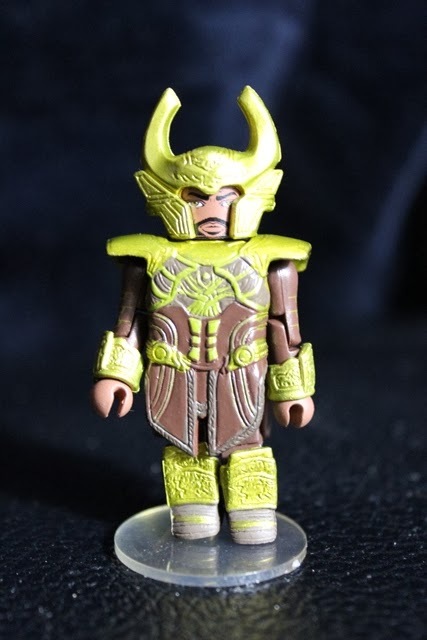 Let's take a look at Heimdall first (played by Idris Elba in the films). 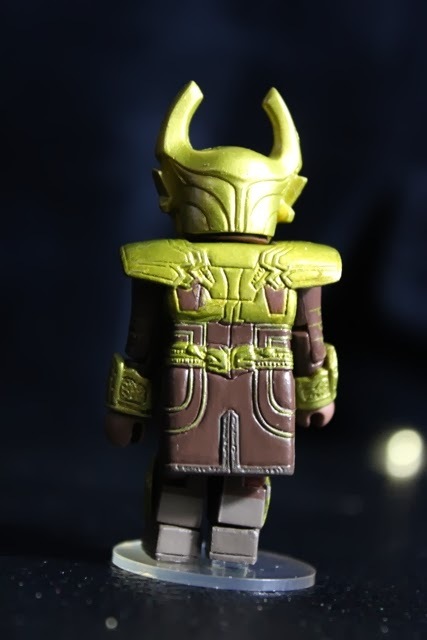 His costume is gold and brown, with intricate "Asgardian" detail over the front and back. His helmet is molded with the same pattern. When his helmet is removed, you can enjoy the features of his face. 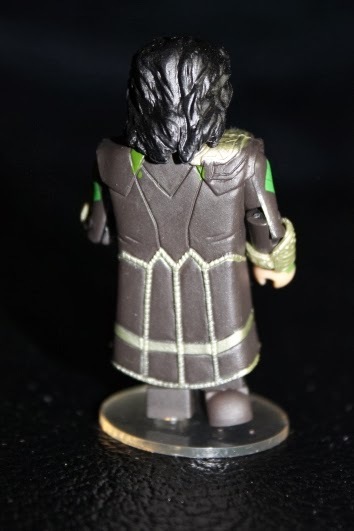 Although, he doesn't look much like Elba, the figure makes up for it with his furrowed brow and forehead wrinkles. This Heimdall is every bit as commanding and imposing as the film's version. There's a slight colour smudge on the back of the armor but it's barely noticeable. The cuffs really stand out and the trim and belt create a interesting look. 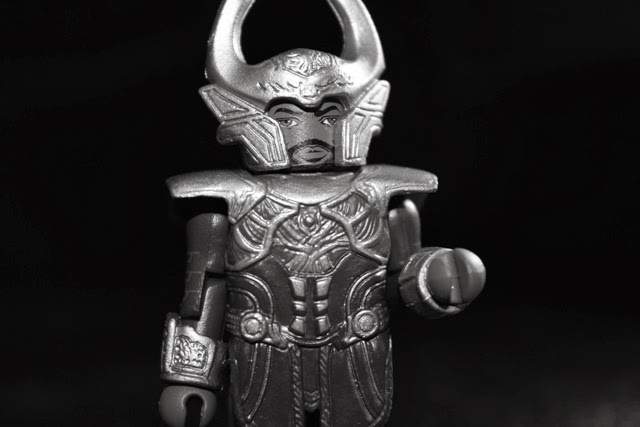 Some minimates are quite simplistic in their design, but Heimdall surpassed my expectations. Unsurprisingly, so did Loki. Tom Hiddleston's Loki stole the show in Thor: The Dark World, and he's doing his best to do it again here. With a spectacular outfit and fantastically molded hair, it's hard for me to choose which one I like best. 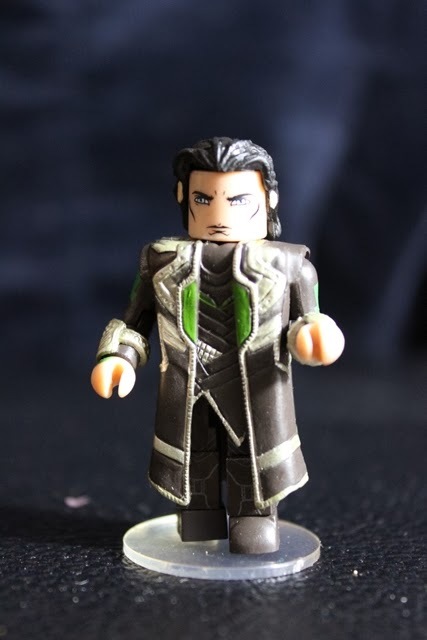 Loki is dressed in a long, brown jacket (darker than Heimdall's) over an armored vest. Both are accented with silver, and touches of green really makes the jacket pop. The pattern on the front is a bit busy (and the painting isn't perfect) but the design is elegant and works well as a whole. The back is more simplistic and provides a good balance. His eyes are a very light blue and his face is menacing, just as the trickster should be. Yes, yes, yes! Those are tiny handcuffs! I love when actions figures come with props. They can turn a good set into a great one. Let's take a closer look. 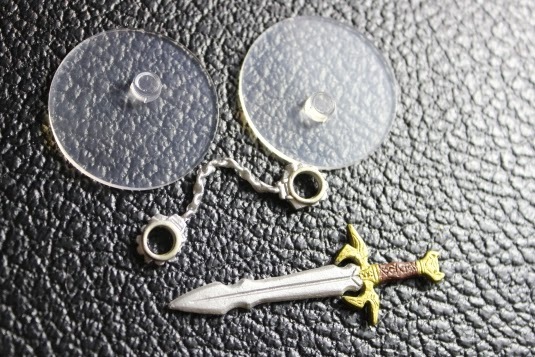 Heimdall, of course, comes with his epic sword, decorated with the same Asguardian symbols as the rest of his outfit. The hilt is brown and gold and the blade is a shiny silver. The handcuffs are also silver with a spiked detailing on the cuffs. The chain is well molded and quite delicate. 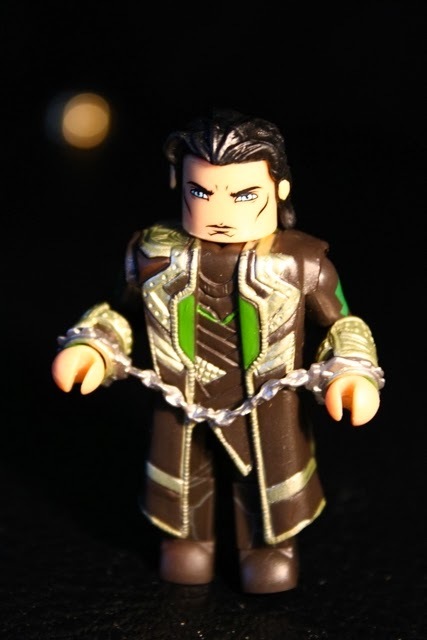 You can attach them, using Loki's hands to hold them in place, but be careful. The hands are a little loose afterwards and I've nearly lost them a couple of times already. My favourite addition to the minimate packaging is the inclusion of display stands. No more precarious balancing required! 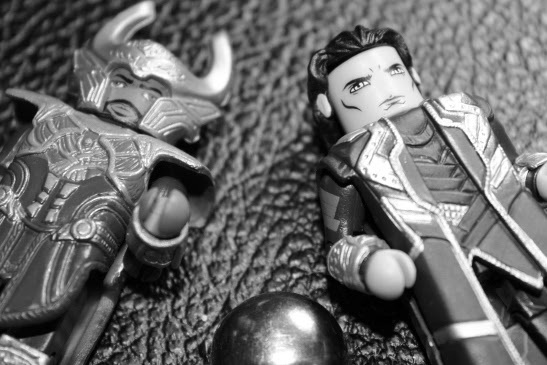 I'm impressed by both of these figures and couldn't help but take a few black and white shots for my own amusement. The contrast really highlights the tiny details. Pleats in the trim, rivets in the armor, patterns everywhere-these figures are so small and yet attention is still paid to every aspect of them. 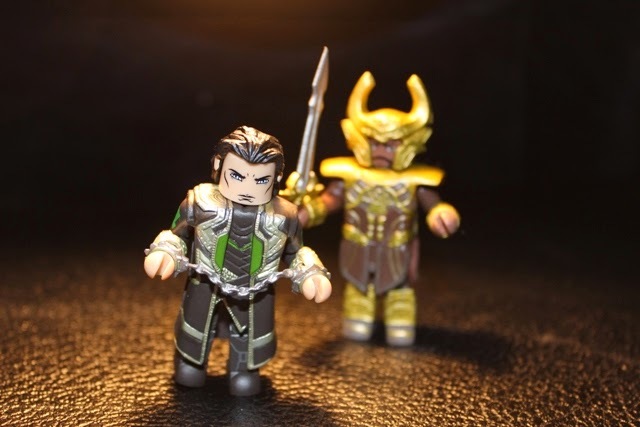 I love minimates and Loki and Heimdall are great examples of what this line can produce. I don't think the cuffs will hold him. Hodor (Game of Thrones) Funko Pop! Brienne of Tarth (Game of Thrones) Funko Pop!